As you all should know the transfer market has begun about a week and a bit now. While there is lots of speculations surrounding Valencia players, I wanted to get enough content before I actually started writing this. So here goes. I wrote earlier about Portuguese youth Ruben Vezo signing a deal earlier in 2013. As such he is the first player to join Valencia in this transfer window. With Ricardo Costa and Mathieu both injured in the last game against Celta Vigo, which ended in a 2-1 loss for Valencia, Ruben Vezo might get his first start alongside Victor Ruiz against Atletico Madrid on Tuesday's Copa del Rey game. Here is an overview of potential players arrival and departure. These are only speculations. 1) Sergio Canales: The attacking midfilder/winger has expressed his desire to leave to get more playing time. After his multiple injuries last year, the player has not fully settled or established himself in the squad. When he was given a chance by new coach Pizzi, this past weekend against Celta Vigo, the results were far from impressive. I thought he was a good prospect when he first arrived, he is talent but I don't see him getting back to what he was before. 2) Daniel Parejo: This is just pure speculation and I doubt this will actually go through. Parejo has taken advantage of the misfortune of other midfielders and has established himself in the team. He is starting every game and doing his job well: keeping the ball and making great passes. 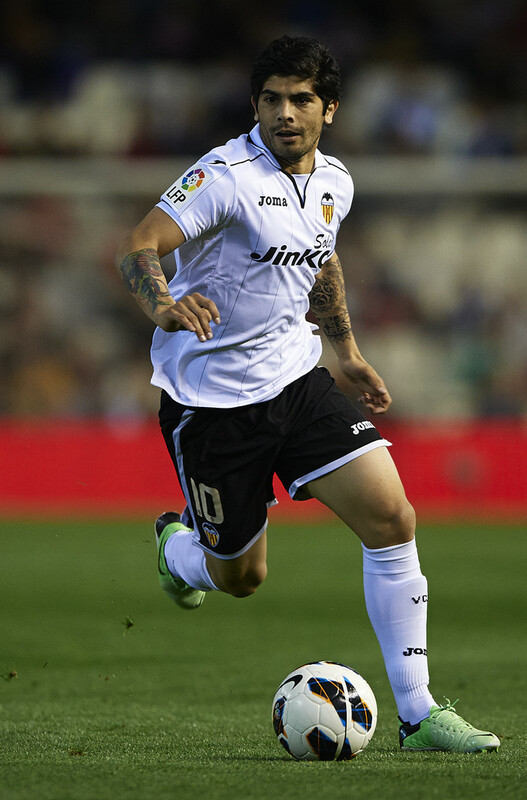 3) Ever Banega: Another midfielder who is linked out of the club. Having impressed in the pre-season, he blew his chances after giving away the ball so much and trying to dribble the entire opposing team by himself. He should've cemented himself as the star player after Soldado's departure but failed to do so and at times became more of a liability. A host of European giants are interested in his signature though which could be in our favor. The biggest area needing improvement right now in Valencia CF is the strike force. Between Jonas, Postiga, Alcacer and Pabon there is a lack of goals. Pizzi caught on to this and requested a new striker and there have been a lot of speculation. Here are the top ones. 1) Eduardo Vargas: 24-year old Chilean striker has fallen out of favor plays in Napoli now plays in Gremio (Brazilian Club) on loan. This striker tops the list since Pizzi requested him by name. His transfer is a bit complicated though as Napoli want to recover the 14 million or so euros invested in him. If he arrives it will be through a loan deal. Known for his speed and dribbling. Price: Loan Deal, Valencia want to loan him for the remainder of the season for half a million euros. 2) Vinicius Araujo: 20 year-old Brazilian forward. A great prospect in South America with his skill-level comparable with Neymar's at that age. If his skill is as good as they say, it will not go unnoticed and lots of the European Giants will try to claim his signature. As such a bid for him would be more probable if Peter Lim, TPG or QIA succeed in purchasing the club. As of now, a loan deal is the only way he can be signed but even that is unlikely since the player himself wants to establish himself in the Cruzerio first team. 3) Felipe Caicedo: 25-year old Ecuadorean striker currently playing in Lokomotiv Moscow. The player seeks a return to Spain where he played a season with Malaga and then Levante after arriving from Manchester City. He signed a five year contract with Lokomotiv but has finished about 3 years and the club might be reluctant to let him leave. Known for his strength and power. 4) Javier Hernandez: Here is a surprise. The 25-year old Mexican striker has been linked with Valencia time and time again but a move never seemed in the cards since the player is valued beyond what Valencia could afford. Even having connections with his fellow Mexican International Andres Guardado on the team wasn't enough to bring him in. The striker has down the pecking order at Old Trafford behind Wayne Rooney, Van Persie and Danny Welbeck is being used too now. His role at Manchester United has been that of a "super-sub" so far, like Nelson Valdez was last year in Valencia, only a lot better. So why is he on the list when Valencia can't afford him? Well recently there have been talks of a trade: Manchester United's out of favor striker for Valencia's out of favor midfielder Ever Banega. Sounds like a great deal to me. I'm sure Valencia might have to put in a bit more cash but overall great deal for me. Price: Ever Banega plus the difference in their values. Well that's all of them. Other names that should be mentioned are Edin Dzeko but that bid has apparently failed and Lisandro Lopez of Lyon but at 30-years old I don't see the club bringing him in. Well I hope you enjoyed the current overview of this year's transfer window. If the purchase of the club does go through there will be more transfers to discuss.